I tend to have a very bad attitude about films that are made with a "message" -- particularly the glut of lousy Christian movies that come off like low-budget tv-movies created for little-watched cable networks and then purchased by the faithful just to feel like they have something comparable to Hollywood's usual output. It doesn't bother me that they have a "message." What bothers me is how amateurish they usually are in terms of production value and how weak the writing and acting often is. However, every once in a while something really amazing comes along from outside those cheap well-intentioned sources who I think are just pandering to what they think people want rather than creating something personally meaningful as a work of art and letting the audience find it. Offhand I can think of THE MISSION, THE PASSION OF THE CHRIST, and SOUL SURFER. Of those three, SOUL SURFER did skirt awfully close to becoming one of those movies I hate. But it was well-written, well-directed, and well-acted enough to rise above my usual cynical take on those type of movies. I just finished watching one of those exceptional films that deserves more attention than it has received. This film moved me to tears. It is deeply humanistic and deeply spiritual. As writer and director Emilio Estevez puts it, it is "pro-LIFE" and "not ANTI-anything" and he is right. "THE WAY" of the title is "El Camino de Santiago" (or The Way of St. James) and consists of multiple possible routes (ranging anywhere from 200km to 800km) all culminating in Santiago de Compostela, Spain, where the remains of St. James, the Apostle are believed to be buried. 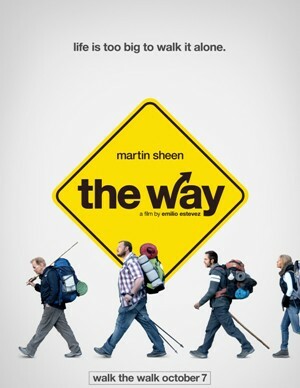 "The Way" is probably about the closest thing the Christian world has to the Mecca pilgrimage of Muslims. It has been around since Medieval times and pilgrimages have been undertaken continuously ever since. The basic narrative centers around an older man, Tom, who has already lost his wife and receives word that his somewhat estranged son, Daniel, had an accident just after starting on "The Way" and was killed. Tom travels to recover the body but instead embarks on a mission to complete "The Way" for Daniel. This is a story about the journey we are all taking with our lives. Our individual lives are a precarious journey through this world and "The Way" is a metaphorical representation of this. Along "the way", Tom's path leads him to others who are on their own journeys and join with him. Essentially, Tom is "Dorothy" and along "the way" he adds his own "scarecrow," "tin man," and "cowardly lion" on their way to the great cathedral of Saint James. Filmed entirely along the actual pathway and, aside from the main actors, they just utilized the real people they encountered while filming. No Hollywood stage lighting, Estevez directed the film entirely using natural sunlight and candlelight at night. It adds to the reality of what you are watching. I was deeply moved by THE WAY, even to the point of tears when Tom finally realizes the reason he went on this journey -- a reason that the viewer understood from the beginning but Tom was too closed off at that point to see. There is profound truth about the human condition and the need for transcendence in life and beyond. It's not a "Christian" film or even a "religious" film. It is a truly "spiritual" film that is full of universal truths about the human race, our relationships with each other, and our individual struggles to find meaning. You should watch it and you should share the experience. It's on DVD right now and is available at your local RedBox.